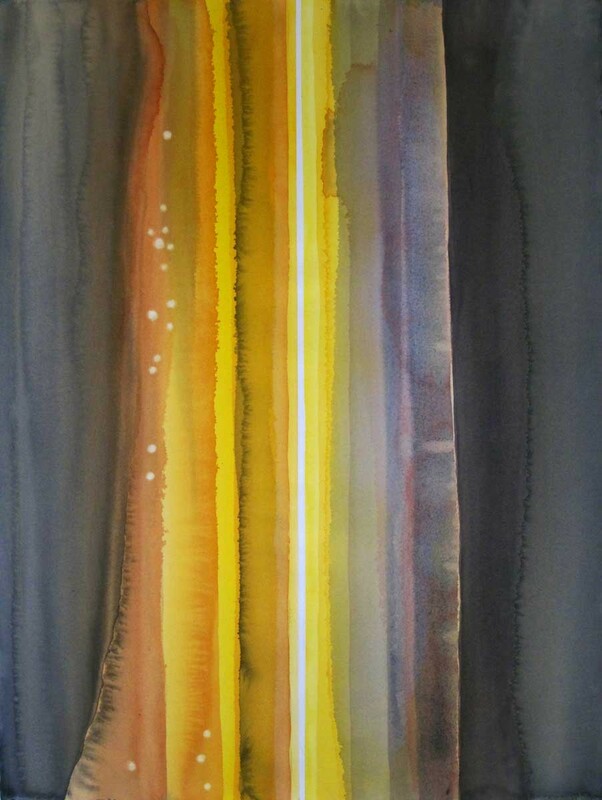 Emily Silver's watercolor on paper "Sun Spot"
Since it opened on F Street last year, the nonprofit gallery Canvas + Clay has been staging exhibitions that approach arts programming in novel ways. Canvas + Clay is affiliated with the Eureka Studio, a fine arts center for people with developmental disabilities and the gallery's two-person exhibitions pair studio-affiliated artists with established locals. Salt, organized by Canvas + Clay program coordinator K.T. Garcia, is among the best of these pairings yet. Watercolor paintings by Ferndale-based Emily Silver, who teaches at College of the Redwoods, match up in fun and thought-provoking ways with ceramic sculptures by Holly Sepulveda, who has been sculpting with clay at Eureka Studio for the past three years. 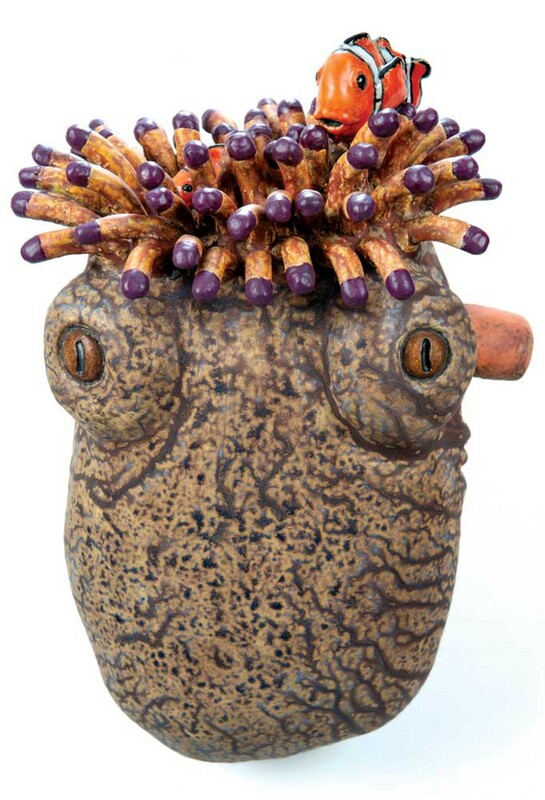 Sepulveda's glazed ceramic sculptures imitate undersea life forms, taking the shapes and colors of reef fish, squid and octopi as their starting point. The artist, who describes herself as "fascinated by the diversity of ocean life," credited the the animation in Finding Nemo with having influenced the look of the lively, big-eyed creatures that populate this undersea menagerie. Cuttlefish, squid, octopi and clownfish are fluently rendered, down to the sucker discs that line each tentacle — made, the artist said, from "little tiny pinch pots." Most are executed at or near life size. "I've studied the creatures closely across the years," Sepulveda told me, and it shows; these are no generic cephalopods but identifiable species whose crazy colors and bold patterns are faithfully transposed. Sepulveda enjoys the trial and error of firing in the kiln, frequently going through multi-stage glazing processes to achieve her glossy surfaces. "Sometimes I use a satin glaze; sometimes I use clear coat over the top to make it look wet." A glaze called Blueberry Satin contributed to the finish of one striking set of periwinkle octo-tentacles. "This is a glaze meant to be applied to red clay bodies but I used it on a white clay body instead," the artist observed, smiling at the recollection, "and it turned out purple." The exhibition title is a point of connection between the very different bodies of artwork on display — one of which draws inspiration from xeriscapes, while the other celebrates the life aquatic. Sodium chloride, a component of seawater, is also commonly found in desert landscapes like the ones that inspire Emily Silver. 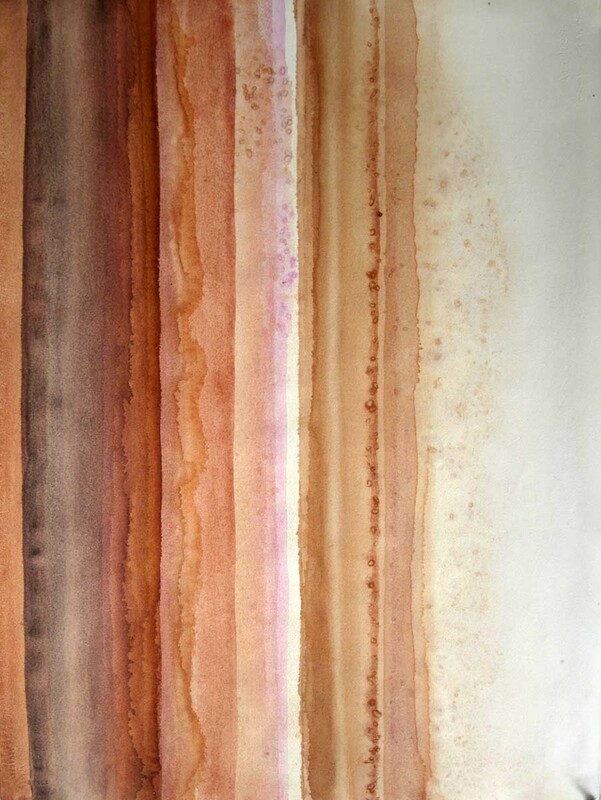 Her abstract watercolor compositions, built up of translucent layers of vertically oriented stripes, map the route of solitary walks in arid landscapes. Sites range from the Great Basin of the Mojave Desert to the salt flats at the Playa artists' residency in eastern Oregon, where Silver spent several weeks painting and hiking last year. Watercolor wash has saturated each sheet many times to form a palimpsest of overlapping contour lines, each correlated to a single foray into the land. Contour variations map the small ways a walker's interpretation of a familiar route will alter from one day to the next. 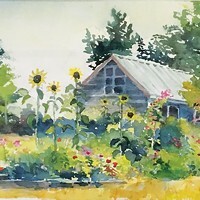 Studio instructor Nicole Kita writes that Silver's watercolors "embody an effort to identify and map the emotional and poetic qualities of place." 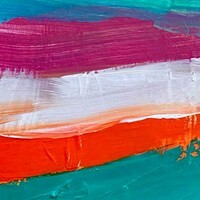 The artist, who grew up in a family of artists and geologists, credits this family legacy with exposing her to the idea that "painting, like walking, is a sequential process of unfolding revelations and recognition." "I seek out opportunities to be in the desert," she said. "I feel very at home and very confident there. I almost never fear. And if I ever do feel fear, I can talk myself out of it." When you walk in the immensity of the desert, she said, "you're trying to orient yourself all the time. You might be oriented to a landmark, or you might be staring at the horizon." She relishes being alone out there, where the solitude and silence can lend themselves to unexpected "revelation moments." Her paintings are oriented to the points of the compass, with north always represented at top. In eastern Oregon, Silver says, "You can walk out on the playa and look eastward, and it's flat salt pan on the other side of the lake. If I am standing there looking out at the horizon, everything I see is very horizontal. What you see is literally a flat, white line in the distance. Nothing that can be seen has crisp edges." 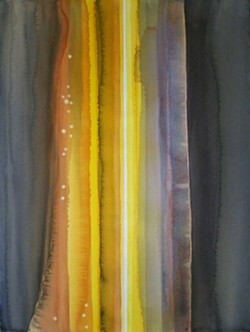 The first few works in this landscape-based series featured horizontal watercolor traces but Silver soon jettisoned that plan as too predictable and made the decision to rotate the compositions by 90 degrees instead, letting lines mass vertically on the wall as a way of creating "that sense of disorientation that you actually feel when you're in the middle of the desert, a long way away from everything." The exhibition Salt: Emily Silver + Holly Sepulveda will be at Canvas + Clay Gallery at 233 F St., Eureka from Feb. 2 through March 2. Call 443-1428.